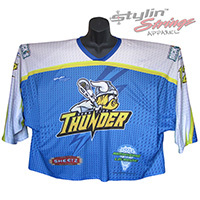 The York City Thunder sublimated box lacrosse jerseys are a unique custom template we designed with the input of the client. From the fit to a hand drawn rendition of the logo had a good amount of input from the customer. We made the logo come to life tweaking it along the way. Custom body lines and lightning bolt patterns made the graphics pop in Chargers colors.